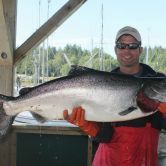 A few days on the water, fish on your line, the best salmon fishing in the world, one of the most majestic place on earth, and 50 lbs a day guaranteed! 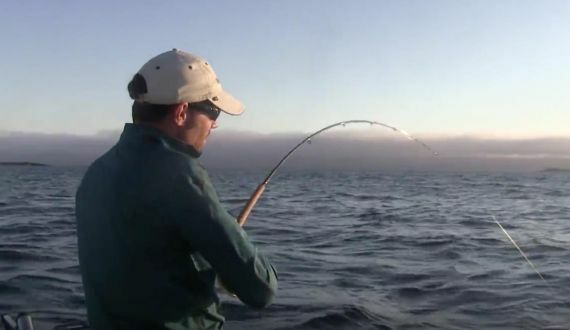 Have you always wanted to catch a fish you’ll remember forever? Have you plunked down your cash for a trip that didn’t deliver? 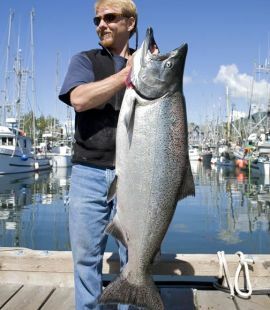 Then it’s time to head to the west coast of Vancouver Island. 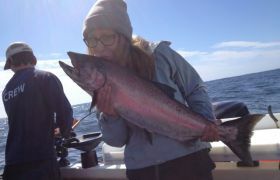 Welcome to Ucluelet, British Columbia! 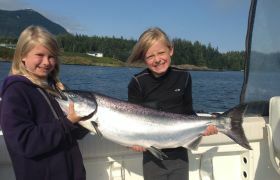 More salmon and halibut swim by our front door than just about any place on earth. 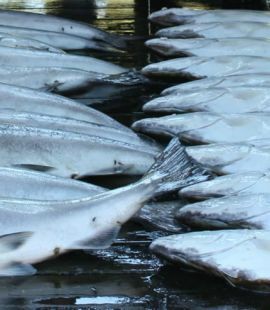 Here you can catch some of the millions of salmon returning to spawn in the Columbia, Fraser, local Stamp River system, and hundreds of other rivers and streams from California to British Columbia, every year. 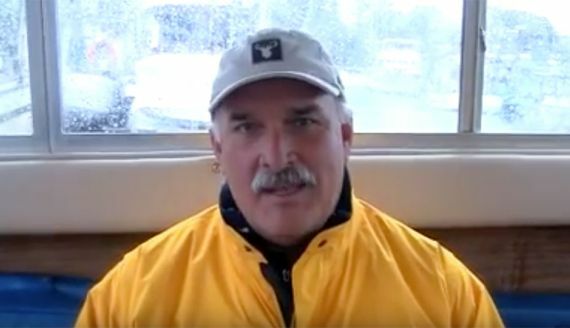 Ucluelet’s waters swarm with giant schools of herring, pilchard, needlefish, and squid. 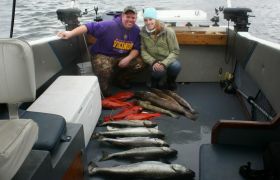 Close behind them are whale, salmon, and halibut gorging themselves to fatten up for the winter. 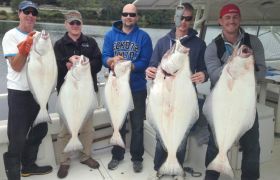 Our fishing packages give you world class fishing, choice of ocean view accommodation, vacuum packing, and good eating fora great value compared to fishing resorts. 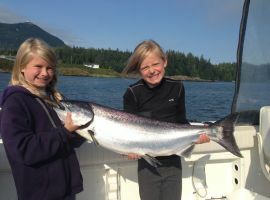 Whether you want to fish for a couple days with your kids, or need a five-star getaway complete with breathtaking accommodation and a spa experience, we have it all! 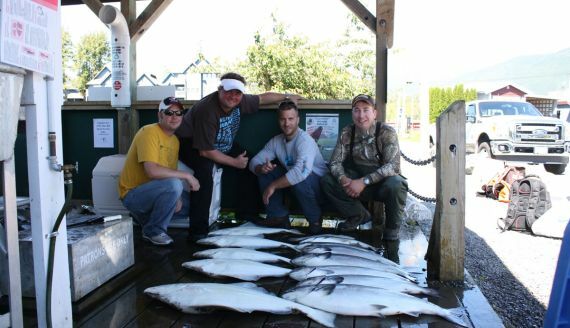 Read more about how we compare to BC fishing resorts here with out paying the price. 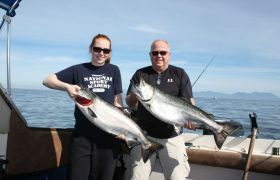 Most of Salmon Eye’s captains have been guiding for 15+ years and combined have over 60 years guiding experience. With these thousands of hours of experience, our guides will get you to the right spot, at the right time, with the right equipment. 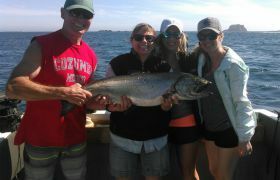 Heard stories of perfect fishing trips? Why not have one of your own? 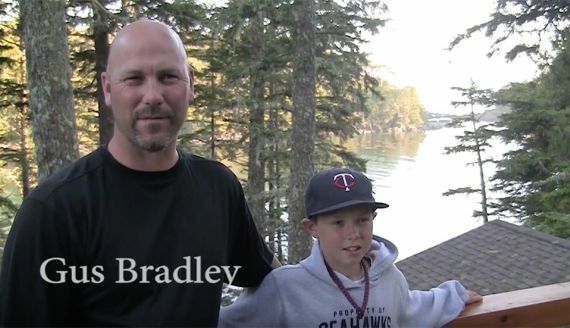 Learn more about our fishing guides here. 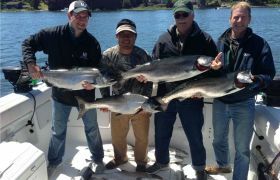 You won’t find better salmon and halibut fishing anywhere! 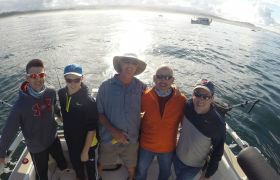 Also, look at your choice of sport fishing boats, and consider the Salmon Eye 50lb Guarantee, our assurance that you are booking the right trip. We care about your business! Drive from Seattle to Ucluelet in 8 hours or less and Vancouver from 5 hours. 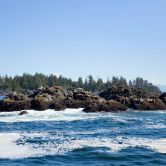 On the scenic highway to Vancouver Island’s west coast, you’ll enjoy stunning natural beauty, such as giant fir trees seeded long before Columbus started for the New World and spruce trees towering hundreds of feet overhead. Don’t forget your camera! Fly from across the US or Canada and be here all in a day. 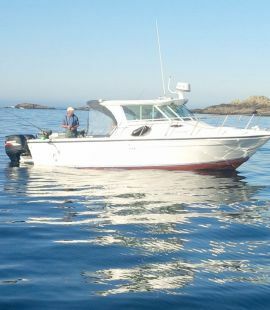 Read more about getting to Ucluelet. 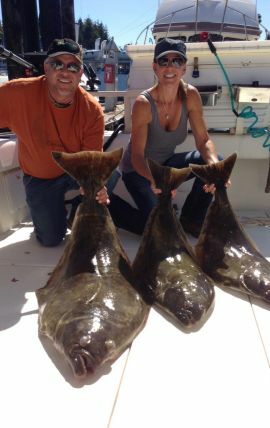 Fishing has been red hot for 2018 and better than all of us expected. 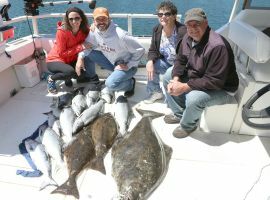 Its time to get your sea legs ready and catch some fresh salmon and halibut for the frying pan as well as get that perfect family photo! 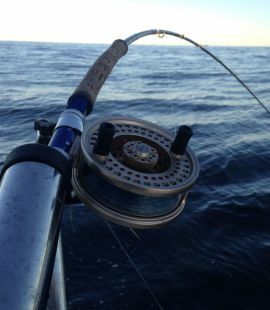 The huge dip in the Canadian dollar has made it very advantageous to fish in Canada since the discount on the dollar is at about 25% right now. (Based on the dollar 1/1.33). 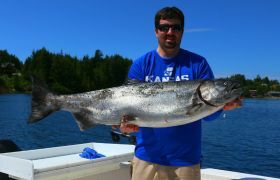 Picture Blog for the summer of 2017 with Salmon Eye Charters starting in March and ending in September. We normally start in April and shut down by about September 20.